LIMITED TICKETS AVAILABLE FOR PURCHASE AT THE DOOR! Live stream is available Worldwide except for exclusion zones. See FAQs to see if you are in an exclusion zone. DFC Fight Fans, get ready for another night of fights not to be missed! Sunday Feb 24th the Diamondback FC brand will once again bring you THE most intense & exciting evening of Mixed Martial Arts action! 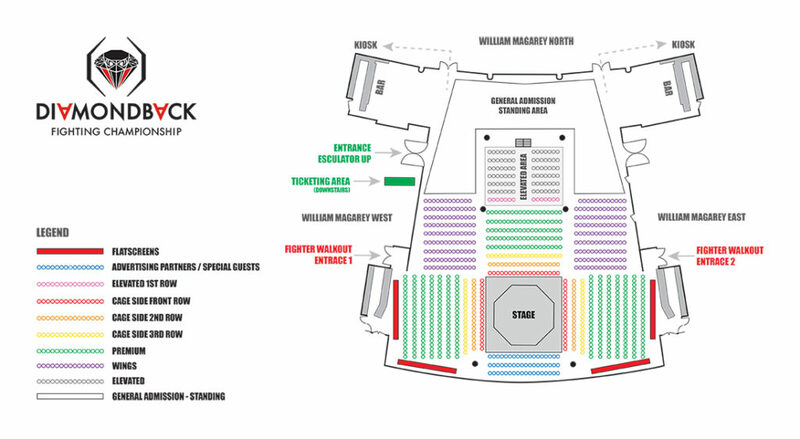 The card is STACKED, so find the best seats now at or risk missing out! 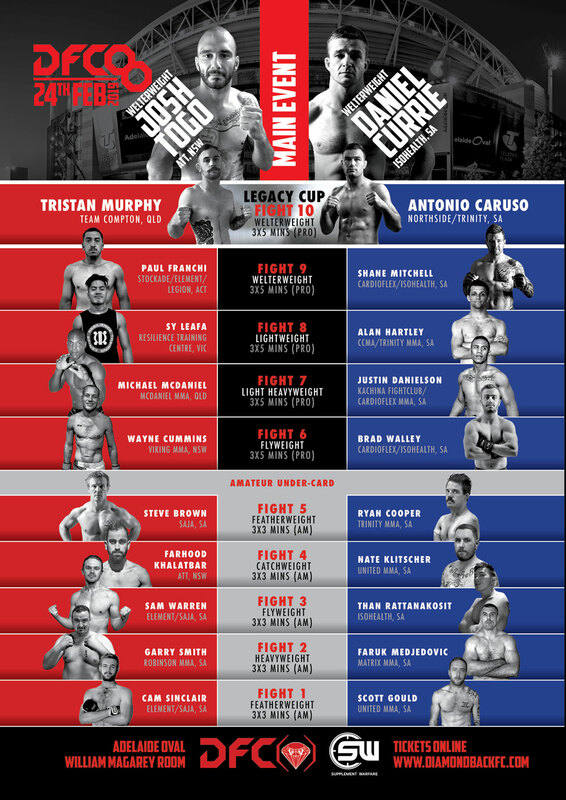 Headlining DFC8 are 3 of Adelaide’s most talented Welterweight Professional Fighters! Dan “The Tractor” Currie takes on ATT hard-man Josh “Gorilla Warfare” Togo, Antonio “The Spartan” Caruso faces Team Compton scrapper Tristan “Mad-dog” Murphy & Shane “AAA” Mitchell meets Paul “The Brawler” Franchi! Our DFC8 Sunday Slam twilight event kicks off with 5 incredible amateur match-ups before the skill-set levels up for our 6-Fight Pro-Card! “King” Faruk Medjedovic makes his return to the Cage vs Garry “G-Unit” Smith! Ryan Cooper locks horns with Olympian Steve Brown! “Antman” Brad Walley makes his pro-debut vs Wayne “Odin’s Blood” Cummins! “Happy” Hartley rematches Simon “Sy” Leafa in a revenge match! Samoan Justin Danielson faces 6’4″ Hawaiian Michael McDaniel! Tickets are available for purchase online or in person from Cardio Flex MMA Gym and gyms with fighters competing in the event. If you purchase your ticket online you will receive your entry ticket via your chosen email address. Please bring a printed copy of your ticket or present on your phone upon arrival at the event. The door staff will provide you with an entry wrist band so that you can move in and out of the event. If you purchase your ticket from a gym you will receive a wrist band which is your ticket for entry. Keep this safe, as you will need to present it to the express entry door staff upon arriving at the event. The wrist band will allow you to move in and out of the event. Once you have been allowed into the event by the door staff, ushers will assist you with finding your section. 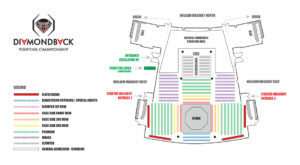 All seats are first in first served and will be filled from front to back. If you are waiting for friends that you would like to sit with, please arrive together. Prior to the event starting, if there are any empty seats you may be asked to move up to fill these. Please be respectful and co-operative with the ushers. Thank you. DON’T FORGET every DFC5 entry wristband gets you 15% OFF at Supplement Warfare stores across Adelaide! PLUS; use discount code: DIAMONDBACK for a huge 20% OFF any Adventure Bay Charter! If you can’t make it to DFC in person, don’t miss a moment and stream this event live! Please note: Live Stream is available in Australia and Worldwide. Live Stream is NOT available in South Australia. Please refer to the FAQ provided on the Live Stream page to see if Live Stream is available in your area. Taking public transport to and from the stadium is strongly encouraged for those attending Diamondback FC Events at Adelaide Oval as this will be the easiest way to enjoy the event at the venue. 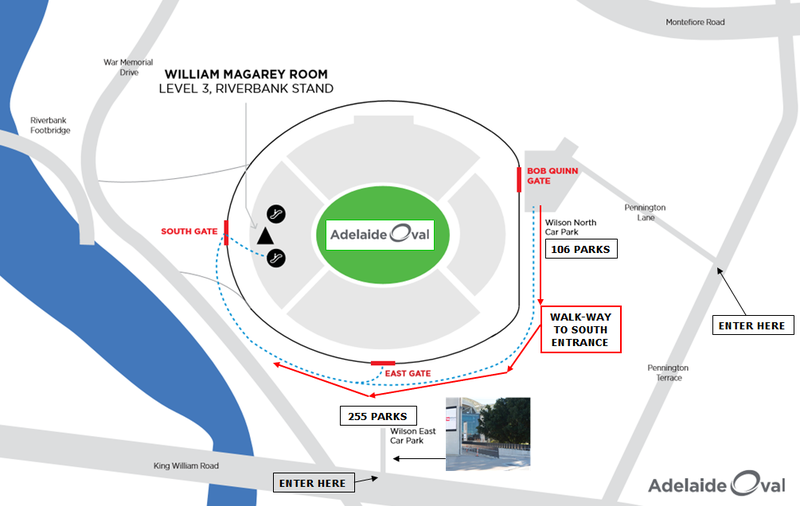 If you wish to park at Adelaide Oval directly there are two carparks available. Enter underground carpark (255 parking spaces) near corner King William Rd & War Memorial Drive OR enter out-side carpark (106 parking spaces) via drive-way entrance on Pennington Terrace. Underground car-park entrance cnr King William Rd & War Memorial Drive. As per the Adelaide Oval Terms and Conditions, visitors are not allowed to bring in eskies of any size or type (including foam eskies), cans, tins, metal containers, glass bottles, glass containers or alcoholic drinks into the venue. You are not permitted to bring food into The William Magarey Room unless necessary for a medical condition such as diabetes etc. Food will be available for purchase at the event. Adelaide Oval encourages the safe, sensible and responsible consumption of alcohol by patrons. Interested in fighting in MMARS – Mixed Martial Arts Rising Stars Amateur MMA series or in a Diamondback Fighting Championship event? Head to our Fighter Registration page and complete the registration form. Interested in becoming a Corporate Advertising Partner for MMARS – Mixed Martial Arts Rising Stars Amateur MMA series or in a Diamondback Fighting Championship event? Head to our Advertising Partners page and complete the contact form. During business hours please call the Stadium Concierge on 08 8205 4700. Alternatively, you can email lostproperty@adelaideoval.com.au of if you would like to speak with someone out of hours please call Adelaide Oval Security on 08 8211 1199.
discounted entry for only $5 (usually $20). DO YOU WANT TO FIGHT IN DFC?